Brisbane's debonair garage-pop dudes Millions are proud to unveil 'Cruel', the title track of their latest EP. Released in November, the 4-tracker features previous smash Nineteen, which Russh magazine surmised as Thin Lizzy, girls and glam rock and was Channel [V]'s Ripe Clip Of The Week. In the wake of the Cruel EP, Millions rang in 2013 with performances at the Falls Festival in Victoria and Tasmania, as well as Southbound in Western Australia. They were also named amongst triple j's Next Crop of artists to watch in 2013. Cruel has just been named Single Of The Week in Beat (Melbourne), who enthused "this fresh-faced garage four-piece is something special." In tandem with this, Millions are proud to announce three East Coast appearances in March that will mark their first-ever run of Under 18's dates. 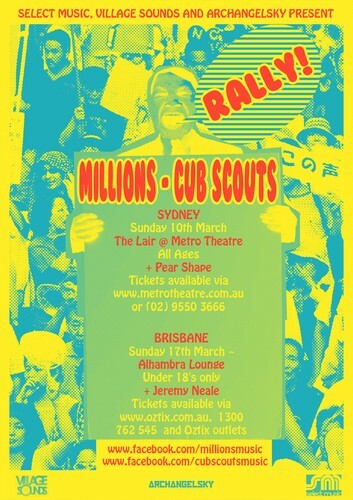 Teaming up with fellow Queensland pop kings Cub Scouts, the Rally! co-headline shows in March will take in performances in Sydney and Brisbane. These two gigs will bookend Millions' slot at the All Ages Push Over Festival in Melbourne alongside The Amity Affliction, DZ Deathrays, Violent Soho and many more. Cub Scouts have enjoyed a dream twelve months themselves, off the back of their debut 2012 EP Told You So. The five-piece took out the Queensland Music Award for Best Pop Song and Song Of The Year for Do You Hear, and have recently gone global with the EP cracking the Top 20 of the CMJ charts in the USA. These Under 18's shows come in the midst of Millions' writing sessions for their debut album. Guitarist Ted Tilbrook said, '"Kids are always asking us to do Under 18's shows and we're glad we can team up with Cub Scouts to make it happen. It'll also give us a chance to road test some of the brand new songs we're working on for our record."